October is Family History Month. It was officially commemorated in 2001 by Senator Orrin Hatch of Utah. The United States Senate unanimously approved his legislation to designate October as Family History Month. At the time, Orrin Hatch encouraged President Bush to call upon the people of the United States to observe the month of October with appropriate, family history related, ceremonies and activities. There are many ways to celebrate Family History Month. You can choose for yourself an idea or activity that will resonate with your family. The goal is to do something that highlights family history. Make family history fun – and tasty – by sharing a family recipe with the younger generations. Dig out the old recipe book your mother used, or the handwritten recipe cards her mother wrote. What if your ancestors and older relatives did not write down or collect recipes? You can always make a food that reflects your heritage. Find a recipe for a food that originated in the country where your ancestors came from. Invite your kids (or nephews and nieces) to help add the ingredients. Tell stories about the relative who used to make that recipe. Or, share stories about the country your ancestors came from. Ask your relatives to share a photo of themselves when they were a child. Pair that photo with a story about what was happening when the photo was taken. This is a great way to revive family stories that have been forgotten about for many years. Compile all the photos and stories in a way that can be shared with your relatives. You could put everything on your family history blog. Use social media to make a Twitter Moment, a Facebook Memories, or Instagram Stories. Self publish a book of all the photos and the family history stories that went along with them. The book would make a great gift for relatives! Today, it is common for people to move away from the place the lived when they were a child or teenager. 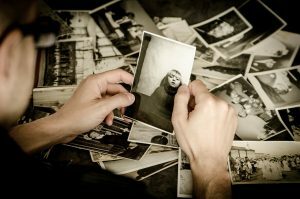 One way to recall and share family history is to return to places where you lived, went to school, or had a significant experience happen. Bring a sibling with you and plan a trip. Make sure to take plenty of photos and to record the family history stories that you suddenly remember. You could write it all down, or record the story in audio or video. Some excellent places to visit include: your old family home, your high school, the location of where you had your first job, and the place your family visited on summer vacations. * Family History Month Across the U.S.